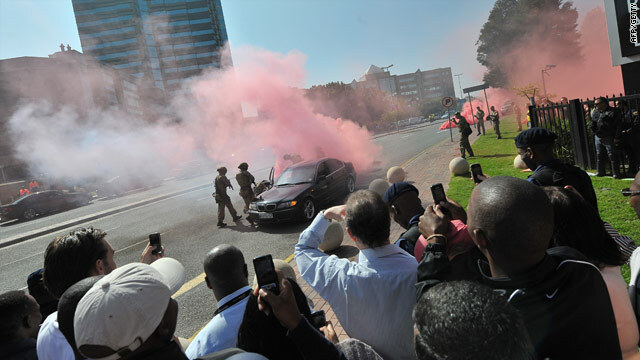 South African police undergo traning in mid-May as the U.S. State Department Friday warned its citizens against potential attacks. Washington (CNN) -- The State Department has issued a travel alert warning U.S. citizens in South Africa to be aware of increased terrorism risks during the World Cup, which starts June 11. "There is a heightened risk that extremist groups will conduct terrorist acts within South Africa in the near future." However, the State Department said, there was no specific information on any threat. Any credible threats will be conveyed to the public, the alert said, urging all U.S. citizens to register with the embassy in South Africa to enable them to get updated security information. The alert issued Thursday urged Americans to be aware of their surroundings and warned that crime is prevalent in the country. It urged visitors not to wear expensive jewelry and ensure valuables were not in plain view. "While driving, keep doors locked and windows closed ... and when stopping at intersections at night or in isolated locations, leave enough space in front of your vehicle for a quick exit." The alert comes as Vice President Joe Biden gears up for a trip to Egypt, Kenya and South Africa during the week of June 7. Biden will represent the United States in the opening ceremonies of the World Cup. This World Cup ends on July 11.